"Searching for metal ore deposits in the limestone caves of Kabwe, Zambia, Swiss miner Tom Zwiglaar is credited with finding the first early human fossil ever to be discovered in Africa. 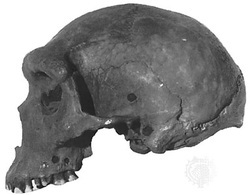 When Kabwe (also known as Broken Hill) was sent to Arthur Smith Woodward, Woodward assigned the specimen to a new species: Homo rhodesiensis. Today, most scientists assign Kabwe to Homo heidelbergensis."